Burton Albion moved two points clear at the top of League One after holding off a second-half fightback from Millwall. Damien McCrory smashed in a 15-yard strike to put the home side ahead before Nasser El Khayati doubled their lead after a stunning counter attack. The London side dominated the second half and halved the gap when Joe Martin pounced after a goalmouth scramble. However, they could not equalise and finished with 10 men after Mark Beevers was sent off for a second booking. "First half we were the better side and scored two magnificent goals, and deservedly so. "Second half, you always know they're going to change certain things and we're going to have to be strong and defend well because they're going to go a little bit more direct. "At times we handled that really well. It's only a little bit disappointing that we got a goal against from a corner. "Normally we are solid from those moments and do that really well, so it was a little bit disappointing." Match ends, Burton Albion 2, Millwall 1. Second Half ends, Burton Albion 2, Millwall 1. Foul by Timmy Thiele (Burton Albion). Second yellow card to Mark Beevers (Millwall) for a bad foul. Corner, Millwall. Conceded by Anthony O'Connor. Substitution, Millwall. Ed Upson replaces Shaun Cummings. Attempt missed. Fred Onyedinma (Millwall) right footed shot from the centre of the box is too high. Corner, Millwall. Conceded by Philip Edwards. Attempt missed. Abdenasser El Khayati (Burton Albion) right footed shot from the right side of the box is close, but misses the top left corner. Attempt blocked. Lee Gregory (Millwall) right footed shot from the centre of the box is blocked. Goal! 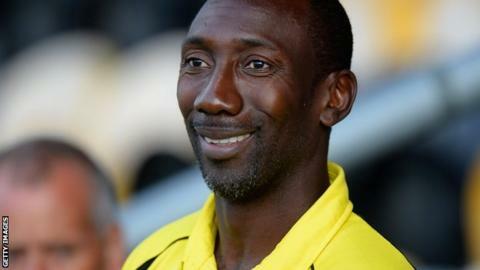 Burton Albion 2, Millwall 1. Joe Martin (Millwall) left footed shot from the centre of the box to the bottom left corner. Corner, Burton Albion. Conceded by Sid Nelson. Attempt missed. Abdenasser El Khayati (Burton Albion) right footed shot from the right side of the six yard box is close, but misses to the right. Timmy Thiele (Burton Albion) wins a free kick in the defensive half. Shaun Cummings (Millwall) wins a free kick in the attacking half. Corner, Burton Albion. Conceded by Mark Beevers. Tom Flanagan (Burton Albion) is shown the yellow card for a bad foul. Hand ball by Tom Flanagan (Burton Albion). Philip Edwards (Burton Albion) wins a free kick in the attacking half.